Even though the French have become somewhat accustomed to protests as part of their political culture, the coinciding of strikes at Air France and SNCF (French Railways) this week have caused a level of disruption the country had not known for a long time. Engaged in separate long-running disputes, workers of both companies have much common. Whilst rail personnel are undertaking three months of action – protesting against reforms proposed by President Emmanuel Macron that include cuts on workers’ rights and plans that unions believe are paving the way for SNCF’s privatisation – Air France workers are demanding a salary increase, arguing that the airline should share with its staff the wealth it accumulated with the 2017 results. The current social unrest in France is, therefore, promising a ‚hot‘ spring. Apart from train and airline staff, pensioners and students have also been taking part in several protests. In at least 15 universities, students have been participating in strikes and lock-ins, showing opposition to the stricter entry regulation announced by Macron. The fresh wave of disputes is predicted to become the President’s biggest challenge since he was elected, exactly one year ago, on the basis of a liberal economic project that promised to boost the public sector – not depress it. 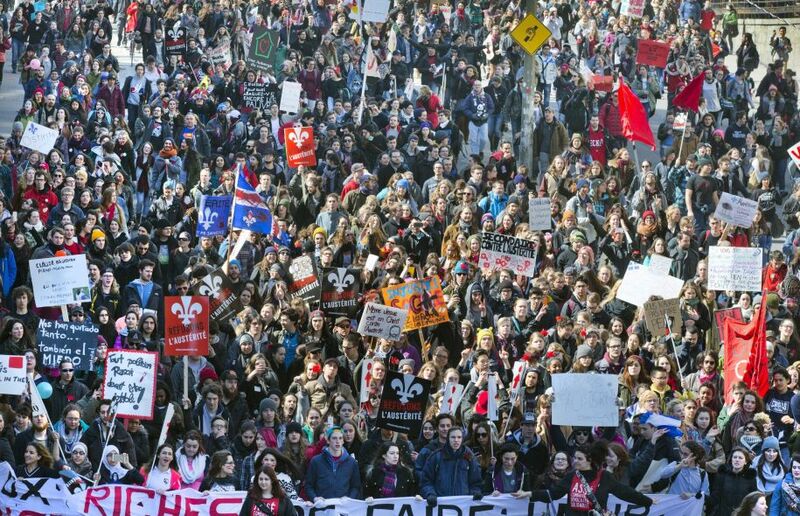 Recent demonstrations (that have also included teachers, waste removers and nurses fighting against the government’s intentions of cutting the numbers of public sector workers), have been described as the largest France has seen in decades. With the public pressure put on Macron set to rise in the coming weeks, this civil uprise is becoming increasingly reminiscent of the widespread revolts that shook France in 1968. During the civil unrest that took place 50 years ago, more than 11 million workers and students took to the streets in significant demonstrations and strikes that paralysed France for weeks. The historic revolt almost overthrew the government of Charles de Gaulle. Many believe that this year’s convergence of struggles will be a crucial test both for Macron and for the protesters. The result of this face-off between the French President and the most dissatisfied part of French society could determine the country’s direction in the coming years.